The B/R/K Pressure Cooking System is the only system in the world with a patented pressure cooking lid that can be used with only one hand, on cooking pots of the same diameter. The “Alpha” Pressure Cooking set (item #631100) includes a 6 qt and 3 qt pot, the patented one-handed pressure lid, 2 glass lids, small steamer, extra silicone gasket, and Beyond Pressure Cooking cookbook. The cookbook is really beautiful. Shipping weight is 18 lbs. The pots are suitable for all cooking surface (including induction). 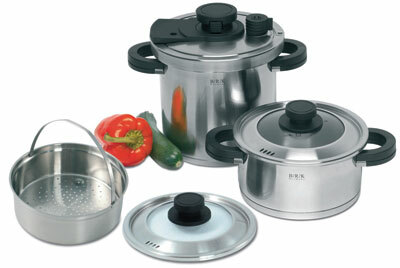 Pots can be used for steaming, cooking, frying, pressure cooking or serving. The pressure lid is 18/10 stainless steel (patented lock system and silicone sealing ring). Pressure regulator with 2 pressure settings. One hand opening system with safety lock. Safety valve with pressure indicator. With a timeless high-quality design and finish the cooking pot is nice enough to take to the table and become the serving bowl. Many years experience and intensive development guarantee optimum convenience in use, and perfected and save technology. There are additional accessories available separately. A double boiler (631110) and pasta steamer insert (631120).